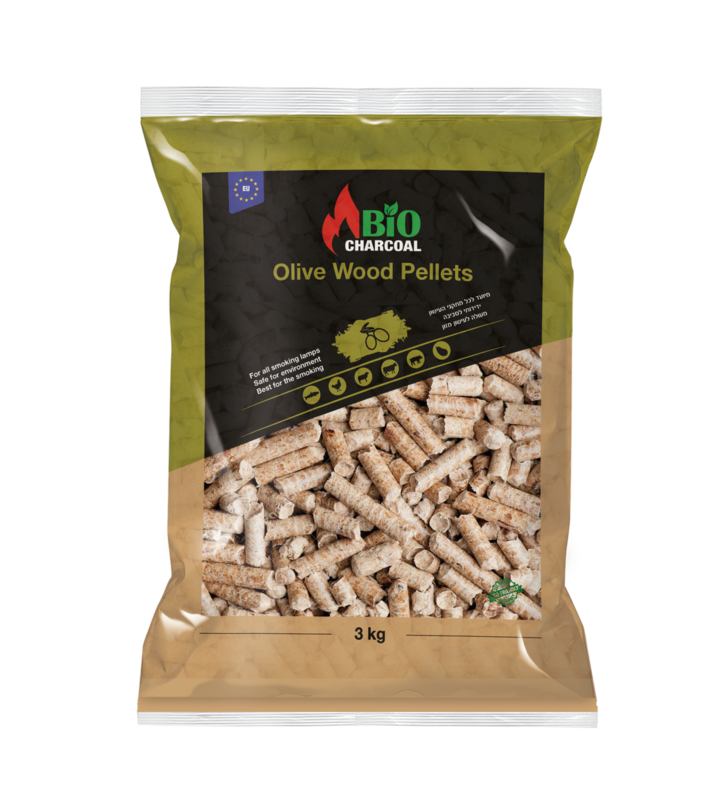 Olive Wood Pellets are an excellent choice for smokers. Suitable for smoking products such as fish, chicken, beef, lamb, as well as pork and vegetables. Even fairly hard meat of wild birds (geese, ducks, partridges, etc.) becomes soft and juicy, acquiring a special flavor and slightly sweetish taste. Wood pellets are a pressed product with a diameter of 6-8 mm and a length of 5-30 mm. Wood pellets are also used for additional flavoring when preparing shish kebab. Granules are added to the main coals, and the smoke produced by smoldering gives the product a unique fruit flavor. The granules for smoking directly affect the taste, appearance, quality of the products. You will not feel any bitterness and acid. The products do not settle with soot. When smoke that gives pellets deeply penetrates into the smoky foods, all products are impregnated with it and get its unique aroma and taste. Therefore, it is so important to choose the right kind of pellets for smoking. Fruit granules are the best for this purpose for the following reasons: Fruit granules, especially olive, contain more essential oils, so cooking is faster, granules are consumed less, they give a lot of fragrant smoke, and do not give soot at all. The aroma from them in the products is unmatched, very rich and pleasant. You can smoke on fruit granules without any additives. To make the dish really fragrant and tasty, you need to use special granules for smoking. They are made of quality raw materials, which subsequently significantly affect the quality of the prepared dish. Make your dish on the grill refined with the aroma of special pellets for smoking! Good smoking is obtained with slow decay of granules, which does not have an open flame, when air is weak, and the temperature is kept within 220-300 ° C.
If the temperature is lower, the smoke can contain more soot, respectively, the coloring turns out to be darker, unattractive, and the taste and aroma change for the worse. First, we take a smoke house, pour the granules with a thin layer, depending on their kind. Then we kindle the granules. After that we look forward to the appearance of smoke. We put on the grate pre-prepared products. And finally, we smoke till the appearance of a beautiful golden color. The number of pellets used for smoking should be several times less than when using chips for smoking. Bio Polus trade mark is represented by a wide variety of bio products for family recreation, comfort, safety and environmental use. Apple Pellets are an excellent choice for smokers. Suitable for smoking products such as fish, chicken, beef, lamb, as well as pork and vegetables. Peach Pellets are an excellent choice for smokers. Suitable for smoking products such as fish, chicken, beef, goat, as well as pork and vegetables. Apricot Pellets are an excellent choice for smokers. Suitable for smoking products such as chicken, duck, beef, lamb, goat, as well as pork and vegetables.